Moses (Diluckshan Jeyarantam), Ramses (Jason Gotay) as charioteers. All photos by Kevin Berne. Cast as the burning bush. 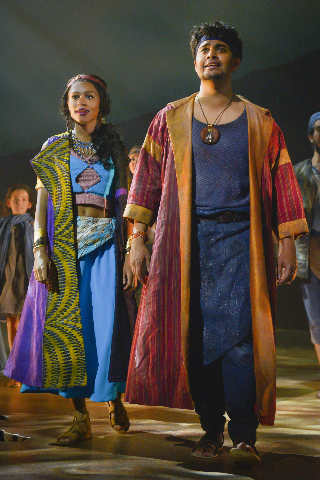 Midianite princess Tzipporah (Brennyn Lark) and Moses (Diluckshan Jeyaratnam). “A friend loveth at all times, and a brother is born for adversity,” King Solomon from the book of Proverbs, the Bible. From the opening pleas of the theme song “Deliver Us,” the sweep of Stephen Schwartz’s The Prince of Egypt fulfills expectations. A Biblical epic with powerful messages about belonging and becoming and a strong score that drives the plot line unfolds. This world premiere production possesses all the Broadway musical characteristics that should lead it to that destination. Director Scott Schwartz, son of Stephen, has guided plays on and off Broadway and at a laundry list of top regional theaters. He coordinates the creative elements into a spellbinding, cohesive whole. 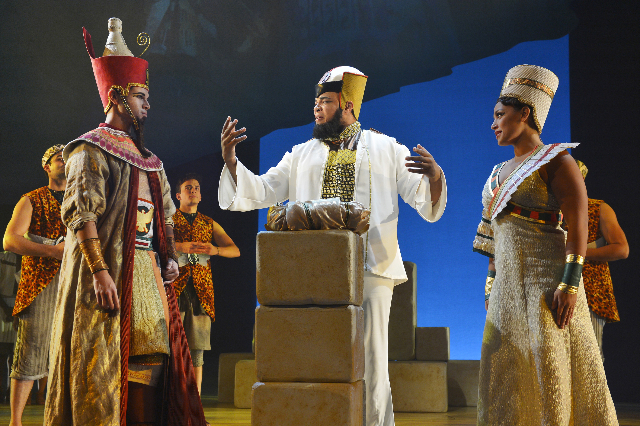 The central storyline is that of Moses, told with the usual literary license taken by Hollywood and Broadway writers. In this case, the book for the musical is taken from the 1998 film of the same name, written by Philip LaZebnik. In The Prince of Egypt, Moses is found in the river rushes by Queen Tuya and is raised as a prince and the younger brother of Ramses, who in later (real) life would become Ramses II, perhaps the greatest pharaoh in Egyptian history. After a somewhat dissolute childhood, Moses would find that he had been a Hebrew foundling; would repudiate his royal heritage; and, in the Biblical rendering, would lead the Hebrew slaves to freedom. Along the way, many episodes from the Biblical book of Exodus are revealed. Much of the narrative focuses on the two brothers raised in harmony but later faced with monumental challenges that would pit them against one another. Their loyalties and principles are tested in an unforgiving crucible that threatens to destroy them both. At a societal level, the play deals with the problems of peoples of different cultures and faiths and how they can live in peace. This applies not only to the Egyptians and Hebrews, but also the Midianites and other peoples of the region. Kevin Depinet’s splendid staging is simple, yet grand, in part because of the height of the stage’s space. Mike Billings’ filtered lighting in soft earth tones projected on the back wall creates a warm sense. The set is bare, but large styrofoam building blocks are moved about to represent everything from temple walls to the pharaoh’s throne. As befits an epic, the ensembles become a dominant and moving element in the staging. 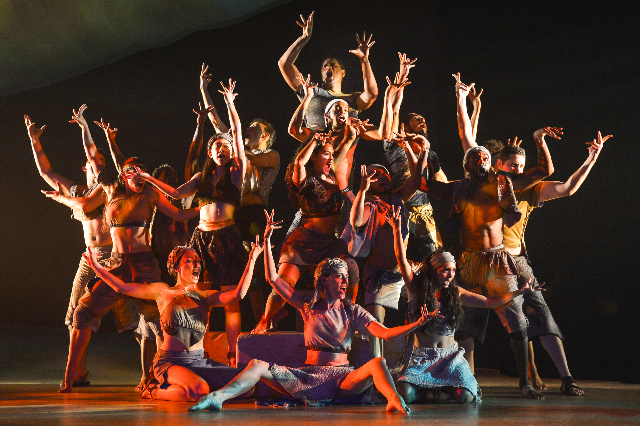 Choreographer Sean Cheesman uses spectacular African-styled writhing and stomping dance and movement with thrashing limbs, expressive finger movement, and bent-forward torsos. But equally effective is how massings of human forms are used to decorate the stage, as well as the clever use of bodies as figurative chariots in a race between the brothers. Schwartz’s music is strongly idiomatic with an exotic, somewhat Middle Eastern motif. Each song on its own is melodious, but collectively there could be more distinctiveness among them. However, many of the lyrics are vital to the story telling and quite memorable. The Prince of Egypt has its weaknesses. Many characters are one-dimensional, but it is difficult to cover so much ground without some short shrift. Biblical stories whiz by like a Ferrari on a freeway, and they are scrubbed of their didactic moralizing. But lest we forget, this is a musical entertainment for the many, not a Sunday School lesson for the few. One technical criticism is that because of the use of overhead speakers to project voices, sometimes the sound seems disembodied. Notwithstanding, musical lovers should find this a worthy entertainment. 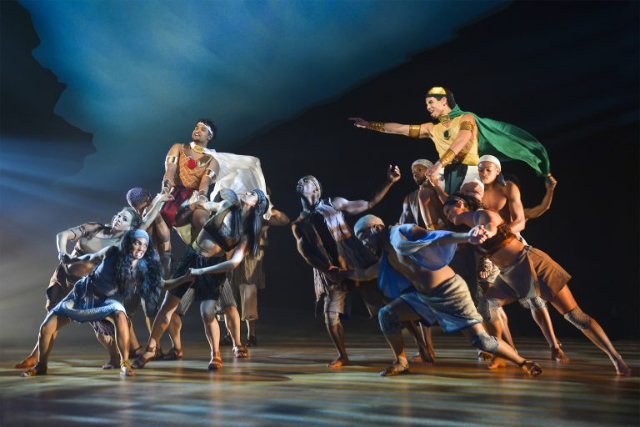 “The Prince of Egypt,” a world premiere based on the DreamWorks Animation Film with music and lyrics by Stephen Schwartz and book by Philip LaZebnik is produced by TheatreWorks and plays at Mountain View Center for the Performing Arts, 500 Castro Street, Mountain View, CA through November 5, 2017.